Home › Storytelling › Stories › Early Bird Tickets for Transition US National Gathering on sale now! Early Bird Tickets for Transition US National Gathering on sale now! Early Bird Tickets Now Available! 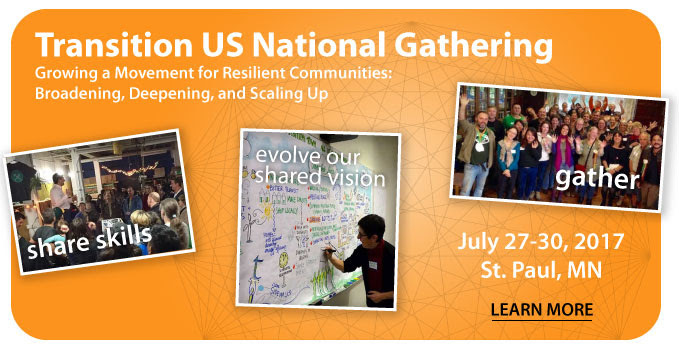 "Growing a Movement for Resilient Communities: Broadening, Deepening, and Scaling Up"
Transition members and community resilience builders from across the country are invited to gather in St. Paul, Minnesota, this July to make connections, share knowledge, and generate strategies to bring the Transition vision of resilient, local, connected and fossil-fuel-free communities to life across this nation. With a team of Transition organizers from across the country, and 75 knowledgeable, dynamic and diverse presenters, this event promises to be inspiring, informative and fun! See below for more information on programming, housing, childcare, and more. EARLY BIRD TICKETS ($195) ON SALE NOW! We are offering a limited number of discounted Early Bird tickets to the main gathering (Friday evening, 7/28 - Sunday, 7/30), available on a first-come, first-serve basis from now until May 15th (Regular Admission $250). Please note: meals, lodging, and tickets to pre-intensive workshops must be purchased separately. Purchase Early Bird Tickets Here! 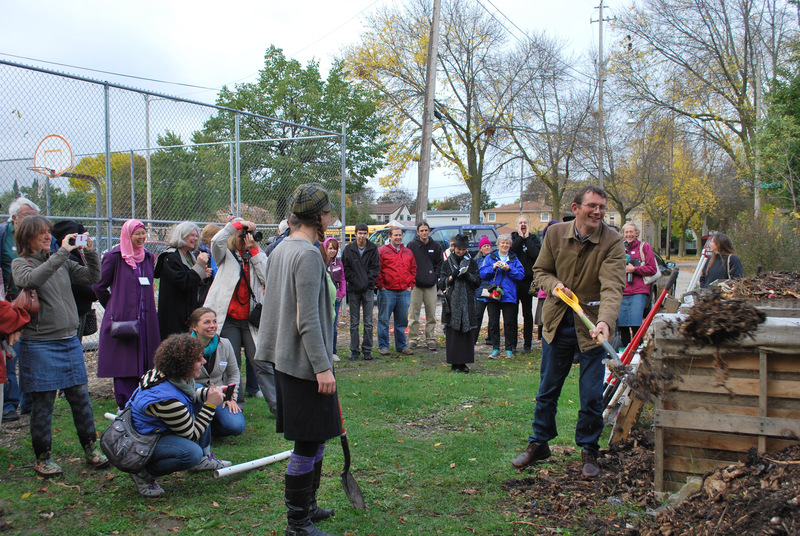 The event kicks off on Thursday, July 27, with two days of intensive workshops digging deep into some of the critical areas of Transition: permaculture intensives, effectively launching new groups, the work of Inner Transition. 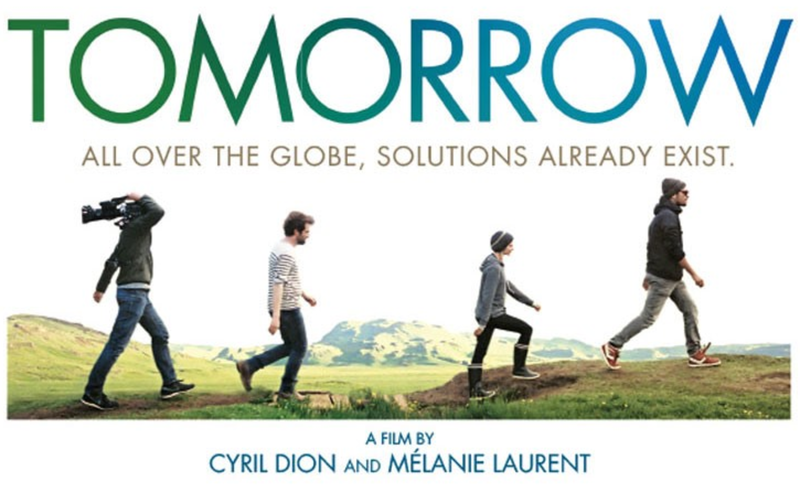 On Thursday evening participants will join with community members to view the award-winning French film Demain (Tomorrow). The main gathering begins Friday evening, July 28, with keynote speaker and Post Carbon Institute Senior Fellow, Richard Heinberg. A journalist and educator who has written extensively on energy, economics, and ecological issues, Heinberg has played a key role in communicating the need for transitioning to a new way of living and doing business. Sunday evening through Tuesday morning, Transition leaders will gather for a "Movement Strategy Session" leadership retreat. Click here to apply to participate in the Movement Strategy Session. Affordable 1- and 2-person dorm rooms are available on campus at Macalester, nearby St. Thomas and the University of Minnesota St. Paul Campus. Ranging from $21 to $64 a night, these rooms are available on a first-come, first-serve basis. In addition, the Days Inn on University, Best Western Capital Ridge and Best Western Como Park are offering a Macalester University discount for hotel rooms. Be sure to ask for the discount when calling or booking online. The Minneapolis International Hostel offers dorm sleeping for $39.95 per person, or a private queen bedroom for two for $79. The Twin Cities has an active Couchsurfing community, as well as many Airbnb locations. There is good public transit in much of the Twin Cities and the Macalester campus is equidistant from both city centers (Minneapolis and St. Paul), easily accessible by bus and light rail. Participants can purchase a meal plan for the Macalester cafeteria, which offers vegan, vegetarian and gluten-free buffet options. To purchase a meal plan, visit http://tngmealplans.brownpapertickets.com. 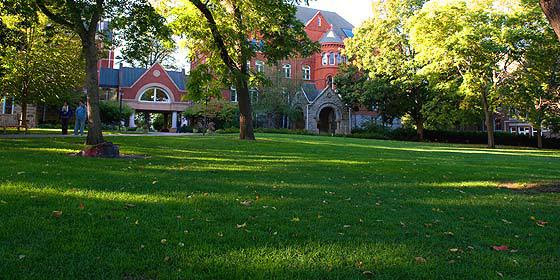 Macalester is a zero-waste campus. You will find regular and organic recycling containers across the campus. Let's make this dynamic event zero waste! The organizers have worked hard to make this historic first gathering accessible, low-carbon, vegetarian friendly, low-waste and affordable. The cost of hosting this event with speakers from across the nation - is roughly $250 per person. In order to make the gathering accessible to all, we are able to offer a limited number of discounted tickets as well as scholarships and work-trade positions. To learn more and apply for our scholarship/work-trade program, click here. We strive to create an atmosphere that is welcoming to all, including families with children. 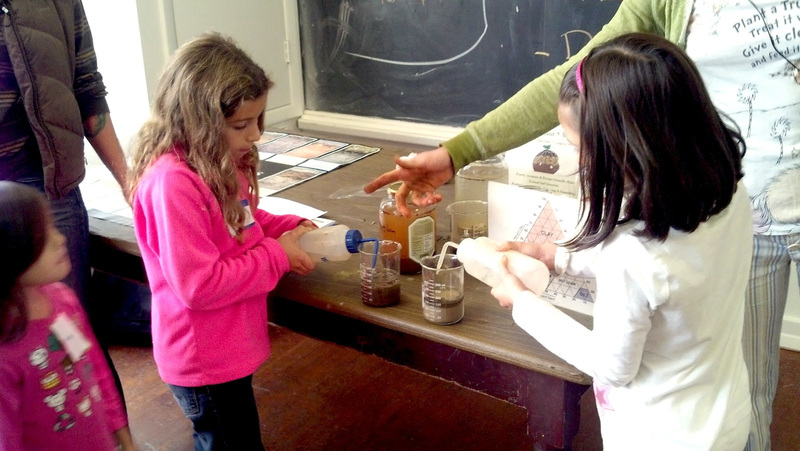 We are working on organizing low-cost childcare; please complete this form to request childcare: http://bit.ly/tng_childcare. After the main gathering ends on Sunday, Transition US will be hosting a "Movement Strategy Session" Leadership Retreat for experienced citizen-leaders in the Transition movement to join together in a more intimate setting to reflect on our journey so far, celebrate our accomplishments, learn from each other, and strategically grow this movement. If you are involved in a local Transition Initiative and committed to taking action to scale up the wider Transition movement, we encourage you to apply here to be a participant in this leadership retreat. Selected participants will be contacted by May 22nd. Please let us know in the form below if you will need to have your participation confirmed prior to May 22nd in order to make travel plans. Interested in joining our team? Contact us at info@transitionus.org or (707) 824-1554 to learn about how to become a National Gathering sponsor, media partner, community ally, or volunteer. More information coming soon!